Yet another huge cleaning brand from the mighty Procter and Gamble. 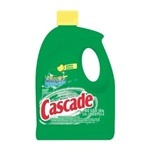 Cascade is one of the top 3 dishwashing detergents in the world. 6 out of 10 households and restaurant kitchens use Cascade for their dishwashers.